Ghetto Sketch is the debut album of Brisbane-based ensemble, MIBUS. Purely instrumental music, Messianic Rock in style, is the forte of this unique band. Ghetto Sketch is dedicated to God's glory, and without the restrictions of lyrics, is able to speak to the souls and tastes of people of all walks and ages. 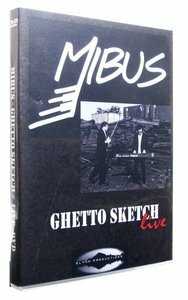 This DVD is the outstanding live show of the Ghetto Sketch album launch at Brisbane's Worship Centre, June 2009. Bonus features include 3 cutting-edge music videos. These vid-clips highlight the versatility and virtuosity of the performers and the outstanding filmwork of Elyon Productions, also Brisbane-based. Birthed at Worship Centre Brisbane is the Messianic rock band, MIBUS. Individually, the Mibus brothers are two of Australias most gifted and talented artists, but together as the front of their band, they are truly stunning. They perform together as only brothers might, with an understanding and intuition, which might otherwise take a lifetime to achieve. Without the restrictions of lyrics, this purely instrumental 5-piece is capable of speaking to all languages and peoples. Focused primarily on glorifying God through modern arrangements of Christian classics, they also perform in genres ranging from gypsy-fiddle to romantic ballads to piano-based rock. MIBUS have collaborated musically with Mirusia (soprano with Andre Rieu), John Foreman (Australian Idol), Roy Fields (US Worship Leader), Transparent (US hip-hop Artist) & Darran Muller (Planetshakers). Customer Reviews For "Ghetto Sketch Live"
Even if you didn't buy the CD you MUST buy the DVD. It shows the character of the guys behind the inspirational music which is MIBUS. This FANTASTIC live Concert recorded in Brisbane last year (I was there) is everything you need for a great night in. LOVE IT!! !